Are you like me? I’d been meaning to take the kids to Cockatoo Island for ages and ages. Friends had told me about it, some had even been camping there. But I had a little mental block about quite how to get there from our place in the northern suburbs of Sydney. I knew it would be a BIG DAY OUT and I wanted it to go well for us all. Do you know that feeling? When you just need the right info and to chat it through with a friend who’s been there? Anyway, I talked to friends, checked the Cockatoo Island website and got a grip. Then I gathered four 9 year olds (my twins plus a friend each) and off we set on our Sydney Harbour island adventure. Waiting for the ferry at Greenwich wharf. Two boys waiting for the ferry. The view of Cockatoo Island as we approached. The ferry about to pull up at the wharf on Cockatoo Island. Well, you can swim or kayak. But most people take a ferry to get to Cockatoo Island. 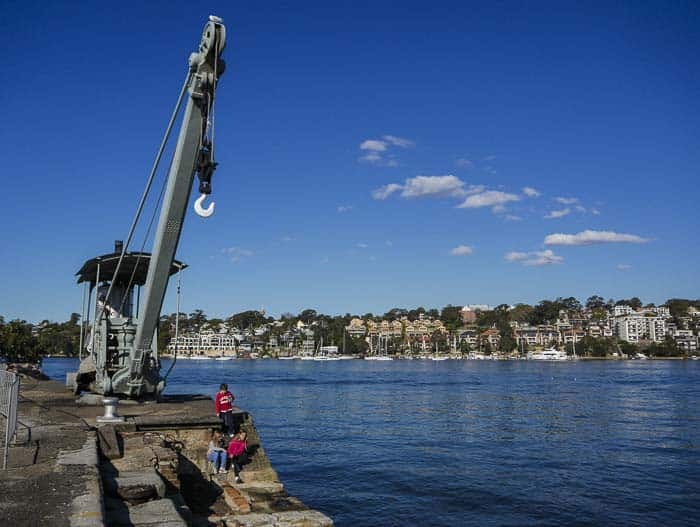 These leave from Circular Quay, of course, and from many other wharves around the Harbour. 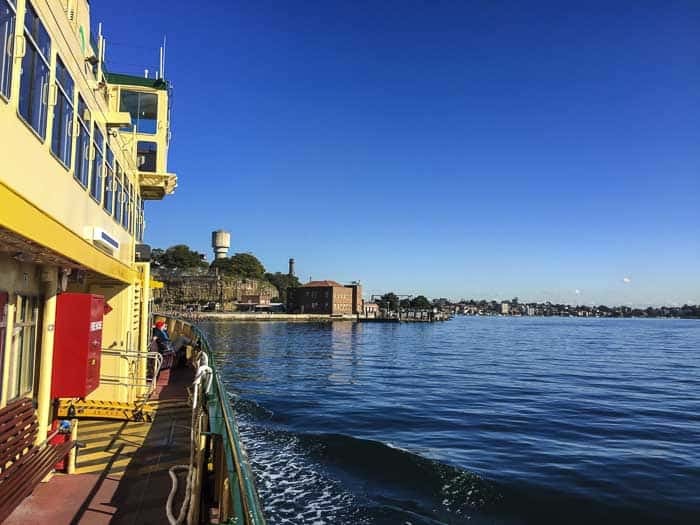 To find the easiest ferry for you, check out the links on the Getting There section of the website. For those coming from the north, the ferry from Greenwich only takes 8 minutes and we easily found a parking spot near the ferry. (PS Do you know Greenwich Baths, click here to read all about this gorgeous spot for kids, maybe good to combine with a visit to Cockatoo Island. NB You should get tickets before or use an Opal card. Tickets weren’t sold on the ferry we got. We went straight to have a snack and drink at the tables by the kiosk which is very close to the wharf. Then we went to the information centre to collect maps and the Convict Clues Challenge booklets. A brief game of chess was played. I had a look at the tents that are set up to advertise the overnight camping on the island. When you get off ferry there is a visitor centre and a kiosk with lots of picnic tables around it. We ate some sandwiches and had a drink and enjoyed the stunning views. Then we had an ice cream and set off to explore. The visitor centre is very good. We picked up booklets to use and also maps and set off on our adventure. 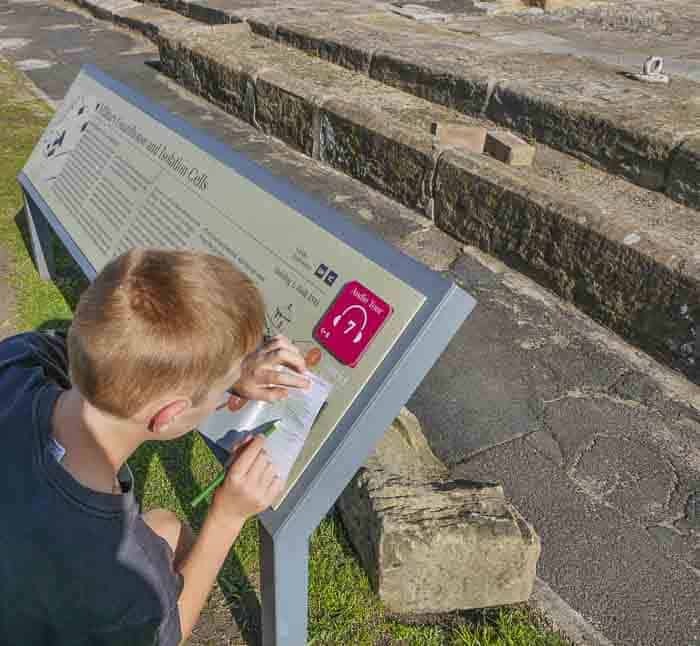 Here’s my son doing a rubbing on one of the boards on the Convict Trail. Lots of convicts would have seen this view. Only one ever escaped alive. My son attempting to escape. This was actually the guards’ secure housing. Very solidly built. 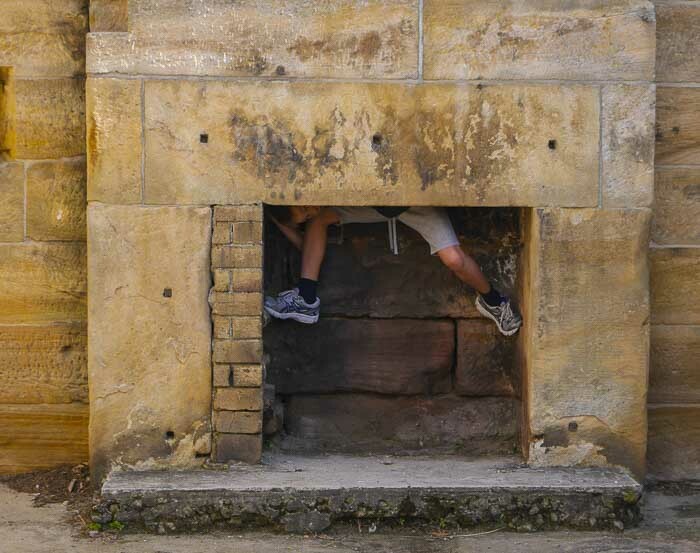 Yes, that’s my boy climbing up the chimney. Once on the island, there are many things to do. We choose to do the Convict Trail and that kept us busy for a few hours. The kids had booklets to fill in. We had to find various places and do rubbings in the books and read the information boards. We all learned heaps and the kids were a great age for this, being pretty independent. I’d love to go one day and see the movie screenings and do an audio tour. Click here for all current activities. Cockatoo Island is NOT the sort of place you will cover in a day. You could easily have two or three visits or stay for a few days before feeling you had seen and read and listened to everything there is to enjoy. PS We are not the best map readers and got quite confused a couple of times. We didn’t manage to follow the convict trail totally succesfuly. We went down a cliffside on the world’s steepest steps, and ended up at the Marina cafe. But we found out way back OK and followed the trail onwards. Walking through the tunnels were a really thrilling part of our day out. As was seeing some of the grain silos hand dug by those poor old convicts. This high walkway was exciting. Children were thrilled by the steeps staircases – me less so. The Marina Cafe from high above. Four nine-year olds enjoyed their visit – they were a good age for this visit. There are heaps of picnic places on the island and some areas where you can BBQ too. There’s also the kiosk/cafe called Societe Overboard near the wharf where ferries come in, plus another The Marina Cafe on the opposite side of the island, plus there’s a proper bar called The Island Bar. 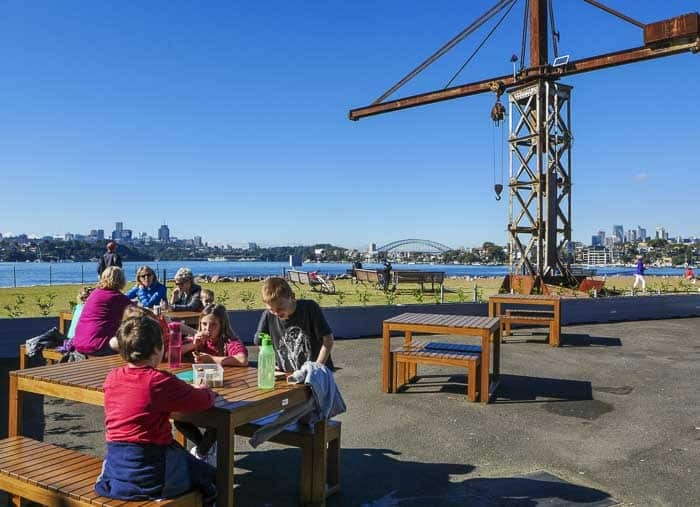 Since opening times vary by season, please do check out this page on the Cockatoo Island website for current info. We did take food as I didn’t want to spend a fortune. We had ice cream when we first arrived and then drinks and hot chips at The Marina Cafe. So no-one will starve… and everyone will enjoy the fab views from every eatery. Seeing the massive industrial structures was a highlight for me. 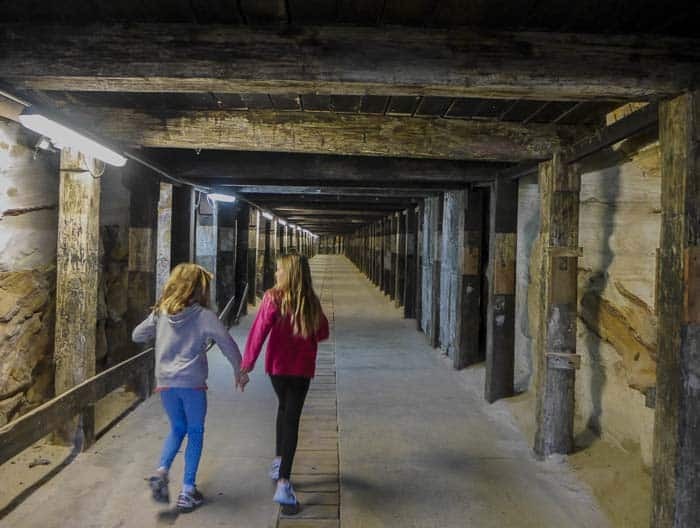 It’s easy to sense the history of Cockatoo Island. And all the colours and shapes and textures are a visual feast. It feels like a real living museum. Running through the amazing Dog Leg Tunnel. Looking at all the huge mechanical structures. Reading about convict life on the island – poor souls. The huge amounts of space to run and play – my wild kids and friends had a wonderful time. There are few fences alongside the water, and many places where kids could jump or fall in. You really need to keep an eye out on younger children. Some steps are very steep. I had heart failure many times as kids jumped around, leaned over fences and played by the sea. There are clearly marked accessible paths shown in the map and lots of flat space down on the levels by the sea and in the industrial areas. But there are many places strollers can’t access easily too due to rough ground and steep steps. 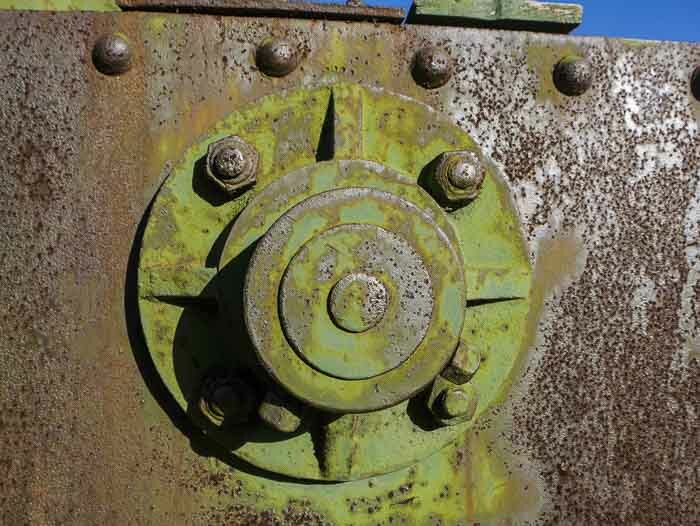 Photo from the Cockatoo Island website. 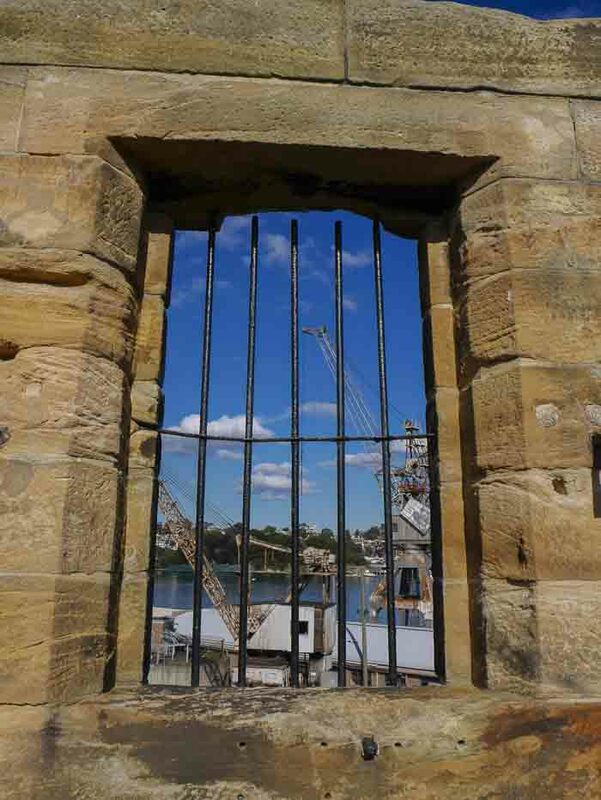 There are lots of different accommodation options on Cockatoo Island. You can camp or glamp in the different tents which are permanently erected. You do need to bring your own food or buy it from the cafes on the island. It’s possible to hire all the camping equipment you need, or you can bring your own. There are apartments and heritage houses for rent too. 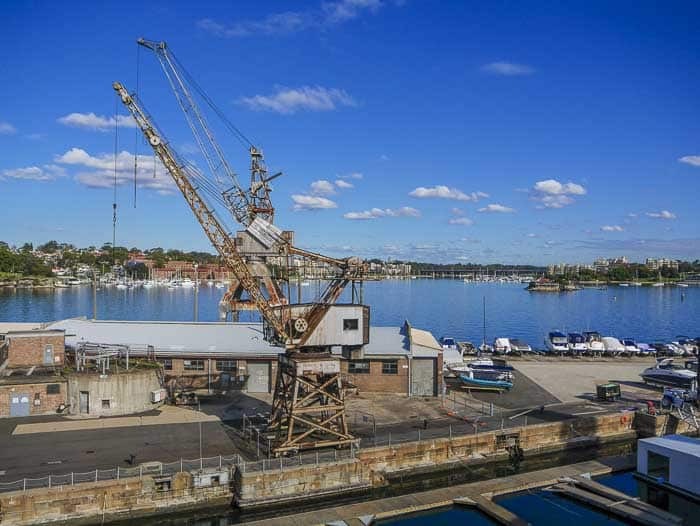 Best thing is to check out the Cockatoo Island website here. 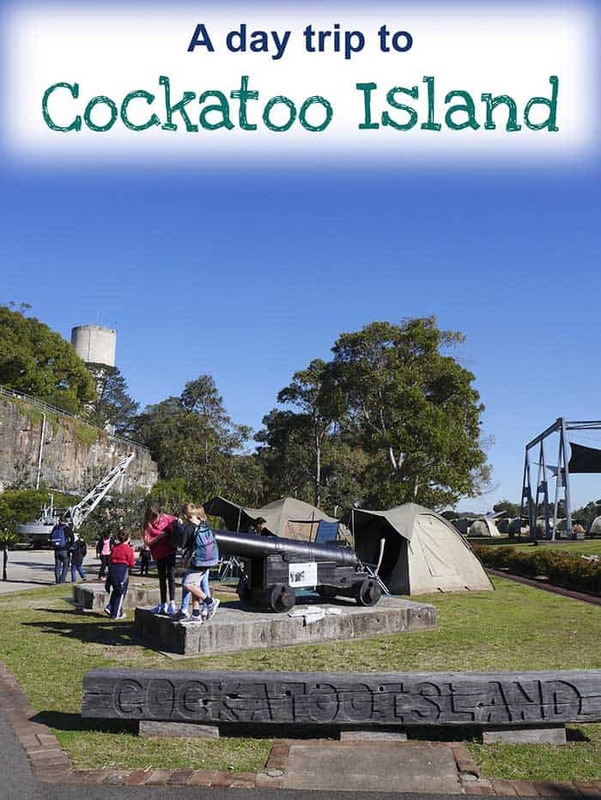 Monday – Friday 8.30am – 4.30pm or email stay@cockatooisland.gov.au. Myself and the kids stayed for 4 or 5 hours on Cockatoo Island. We live in Sydney and so can easily visit again, and we will. If you’re visiting Sydney then you’ll probably want to stay a bit longer, depending on the ages of the children. I managed fine with the nine year olds. I wouldn’t have gone with so many younger children unless there were other adults around to help – and make sure they didn’t throw themselves in for a swim. 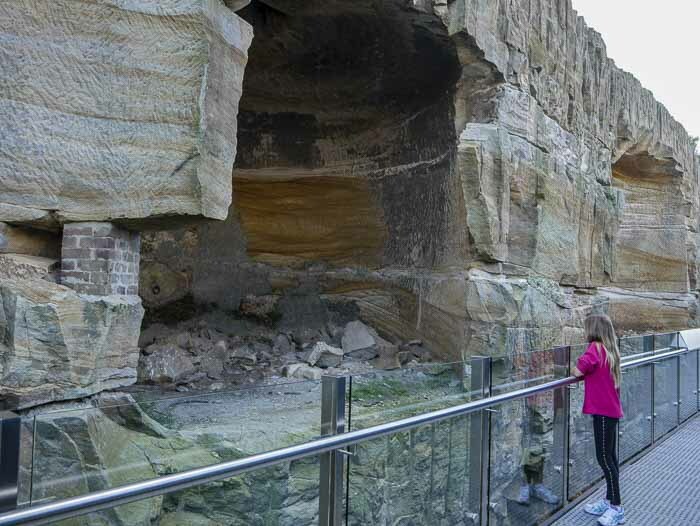 So who’s planning a trip to Cockatoo Island? Have you camped there? Your top tips? Happy exploring this beautiful city of Sydney. The stay covered a Thursday night when I was the only one camping (which was a beautiful yet eerie experience) to a Friday night that was a full house and I felt a few too many were there to party with no one having to worry about the drive home! Great post and very timely for my discovery today. Thanks! Now I’m super excited! 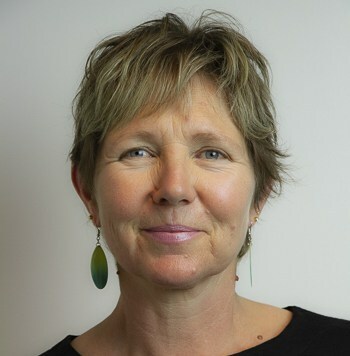 Thanks Linda, I was looking at Cockatoo Island from the Drummoyne side the other day i.e. from the south side and thinking we must go again. I’d like to camp but yes can imagine there might be some weekend shenanigans. Mid-week in school hols for us. Hope you had a great time there Sarah. This is so handy as we have been meaning to go and camp at Cockatoo Island ourselves, and we don’t even have children to worry about. I know I would just love to spend a day here on my own, reading and exploring much more slowly than I can with my kids. And then sitting in the bar watching sunset – will get there one day. Hope you enjoy a stay soon Paula. 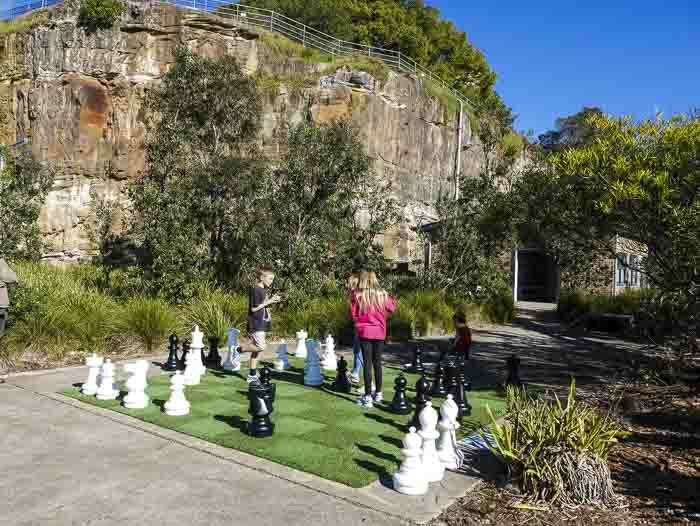 Sounds like you had a great day out but Cockatoo Island isn’t just for kids. D and I stayed there a few years ago – for a few nights in one of the cottages. It was pure magic in the evenings when all the day visitors had gone home. You have made me think we should do it again. My pleasure – will get back to read more of the posts too. I have never thought of going to Cockatoo Island before, probably because I didn’t know what was there. I will put it on our ‘to do’ list for the September school holidays. Thanks for the info. 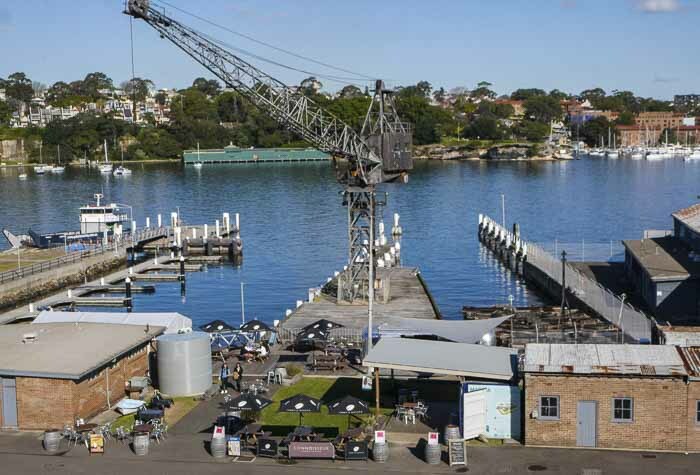 Cockatoo Island is yet another hidden treasure from Australia. In the middle of an electric city, Sydney, this place offers a quite and peaceful experience to the visitors. No need to plan in detail for this trip, Just pack your one-day bag and go ahead. The rest will be, as said, history, oops, memories. Hi, I found your info very useful. There is limited info on things to do on the Island. I am from Malaysia and Cockatoo Island is one of the place I am planning to visit with my 7yo. I hope he will enjoy the Convict trail. Hello, I’m sure he will love it. It’s a beautiful place.